1. At least 2 hours ahead of roasting, pat the chicken dry with disposable paper towels. Working carefully and slowly with a sharp knife, separate the skin from the meat; start from the bottom end and work your way slowly up towards the breast. Try to avoid piercing the skin with the knife. Do not cut off extra flap of skin. 2. Squeeze the lemon juice into a large mixing cup/jug. Add rosemary, garlic, olive oil and Worcestershire sauce and stir thoroughly with a spoon. Grab a little of the rosemary/oil mixture with your fingers (or tablespoon) and gently push it under the loosened skin. Use your fingers to make sure that you rub the oil mixture as far as possible under the skin. Use the remaining oil mix to rub the inside cavity of the chicken, as well as the outside skin. Rub the inside cavity and outer skin with salt and pepper. Let chicken rest in a bowl in the refrigerator for at least 2 hours. 3. When almost ready to roast, preheat oven to 220°C. 4. Toss the potatoes, shallots, oil, salt, pepper, and garlic (if using) in a bowl until well coated. 5. 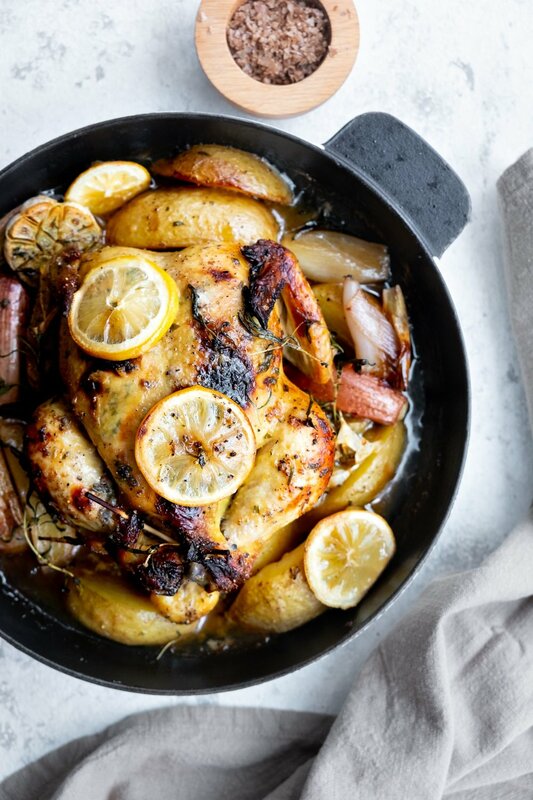 Place chicken in cast iron pan together with the potatoes and shallots. Drizzle any left over oil mix over the chicken and garnish with rosemary sprigs (if using). Cover the chicken with a piece of foil and let cook in oven for 60 min. Scoop juices from the pan and pour over the chicken and potatoes. Turn the potatoes over if necessary. Return to oven (with foil on chicken and cook for another 30 minutes. Remove foil from chicken, scoop juices from pan and pour over the chicken. Return to oven and let cook (without foil ) for another 30 -40 minutes.